The UK civil air notification procedure aims to reduce the risk of mid-air collision between low-flying military aircraft and civil aircraft. It mainly affects weekday hang gliding and paragliding. With a few exceptions*, the military does not fly at low level in Britain at weekends. * For an exception, see this video of the Red Arrows beating up one of our flying sites — as caught by a movie camera mounted on a hang glider looking down on them! The hang glider or paraglider pilot contacts the RAF low flying booking cell by telephone or via e-mail to inform them of their intention to fly at a specified site the following day. The RAF uses that info to raise a notice to airmen (NOTAM) which is distributed to military aviators of all services, who are then aware of our presence. Correspondingly, first thing on the day we fly, we check the day’s NOTAMs, either by telephone or via a web site dedicated to that function, to discover any airspace closures that affect us at the flying site or along any potential cross-country routes starting at that flying site. However, when I get back from a day’s flying and I am on holiday at home (and, therefore, able to fly on weekdays) I find it hard to meet the 20:00 deadline for the civil air notification procedure. It takes a while to check the forecasts, look up NOTAMs for the following day, check the club web site for any problems with the hill or hills concerned, then send the mail. On top of that, this year we again encountered problems communicating with the RAF low flying booking cell. As I write this, volunteers at BHPA Central are using their own time and energy in re-drafting the procedure. Its strikes me that the solution to such problems is the same as is used in administration systems in the commercial world; automation. As far as possible, we should take the human out of the loop in terms of the admin donkeywork. However, keep a skilled and interested human in the loop to check for sanity in the system (in case of breakdown). For each official site (with a BHPA site code) if forecast weather is within the site flying limits (wind direction and strength, and not pouring with rain) automatically generate an advisory for that site. Possibly, for some popular sites, make that an automatic full NOTAM. The data that drives the XCWeather web site’s prediction for the next day might be the input to such a program. 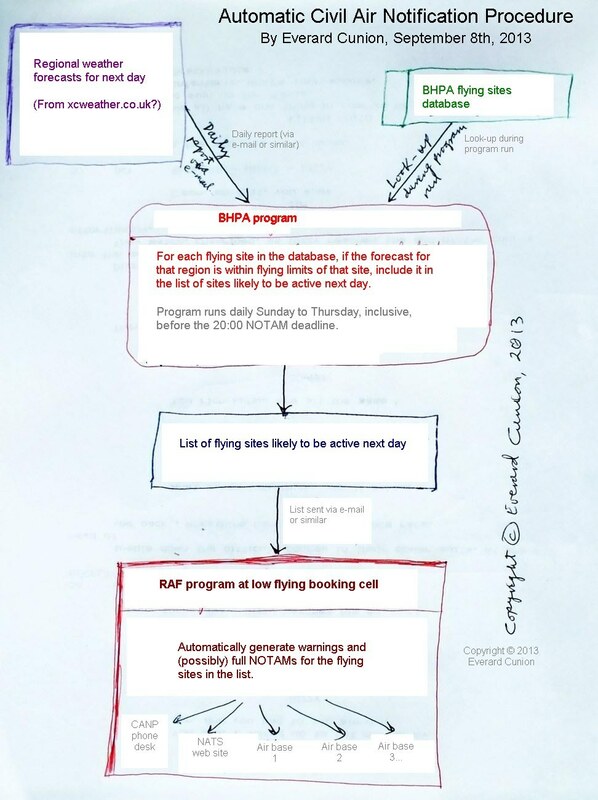 Two programs would need to be written: One at the BHPA to generate the list of flying sites likely to be active next day, and one at the low flying booking cell to turn that list into warnings and, possibly, full NOTAMs. Naturally, when you initiate CANP for a site, any automatic advisory for the site would be overridden by a full NOTAM. Ideas like this are two-a-penny of course, but finding someone with the skills and spare time to do implement them, for no reward and no recognition, is the hard part.